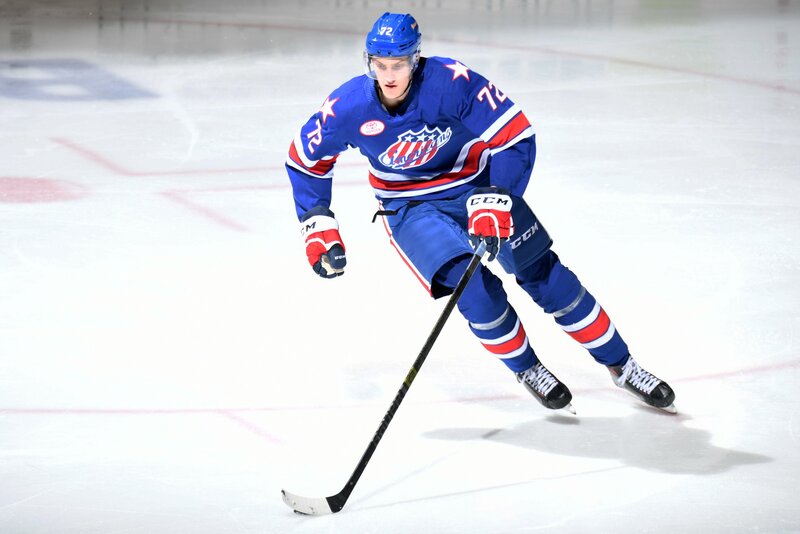 Tage Thompson Leads Amerks to a Win · Let's Go Amerks! Tage Thompson was the center of attention Friday night in Rochester. He has spent all season with the Buffalo Sabres and after 65 games played in the NHL he was assigned to the Rochester Americans this week. You could say it’s where he should’ve been months ago, you could call it a demotion, or you could also call it a fresh start to his season. He’d just playing where he’s assigned. By the end of the game he delivered a memorable performance. Some bad plays, some questionable, a shattered stick, a penalty, but more importantly two goals and an assist. The game winning goal and the insurance empty net goal. The Amerks won 4-2, are now within a point of first place in the North Division, and only one point away from clinching a playoff spot. Laval only had one shot in the second period. One. Rochester had 20 shots in the second period. 20-1 advantage in shots is pretty good for 20 minutes and the Amerks built off of that the rest of the game. It took a little longer than the first puck touch and first shift to really find his groove, could be said for most of the team, but once it happened the team was in control of the game. Thompson had a reputation in Buffalo for toe drag turnovers, shots getting blocked, and coughing up the puck. Once those three things happened he was playing a new game. For two seasons Chris Taylor and the coaching staff have talked about the benefits of being able to make mistakes, learn from them, and go back out for your next shift to recover from them. The way the game started for Thompson there’s probably some out there who said or thought there’s no way he should be playing. Sean Malone scored the first goal for Rochester at 9:56 of the first period on a delayed penalty. Brandon Hickey shot the puck wide to the left side of the net and it popped out on the right side where Malone was able to pull the puck to the front of the net from the goal line and score. A delay of game penalty by Thompson gave Laval a power play where they were able to score. Thompson intended to ice the puck from behind his own goal line but instead sent the puck flying the length of the ice in the air and out of play. Instant delay of game penalty. Maybe a door was open and created a tail wind. That puck had some lift to it. The only goal in the second period was scored with 2:08 left in the period when Danny O’Regan blasted a shot from just below the face off circle past Michael McNiven on the power play. Thompson beat a Laval player to the puck in the corner forcing it along the boards. Remi Elie sent a pass around the boards to O’Regan who skated to just below the face off circle and let a shot rip over the shoulder of McNiven. Alex Belzile scored just 29 seconds into the third period and tie the game 2-2. It was a combination of two mistakes. Nathan Paetsch chased Daniel Audette around the back of the net and as he did it left an opening in front. Thompson was up closer to the point and Taylor said that he should’ve dropped back a little more but it was also on Paetsch who shouldn’t have chased the puck behind the net. Still, that didn’t get either player glued to the bench. Thompson scored what would be the game winning goal at 8:37 of the third period by redirecting an Arvin Atwal shot from the blue line. Andrew MacWilliam had the secondary assist. Positioned in the right place, stick in the right place, and the puck went into the net. A bad penalty that resulted in a goal against, a bad read on a penalty kill that resulted in a goal against, scored a goal, and when it came to the last minute of play he was back on the ice when Laval had their goalie pulled for more minutes. Kevin Porter and Nathan Paetsch battled behind Adam Wilcox for the puck, Paetsch sent it up ice, and Thompson launched the puck this time low to the ice and straight into the net. Insurance goal with 6.4 seconds remaining in the game. * Adam Wilcox made 17 saves for the win and was stellar all night. The first goal was the result of a player being tackled on top of him and the second was the broken play described above. Glove saves, pad saves, stick saves, and sprawling saves. * When Danny O’Regan scored it was his 20th goal of the season. This is the first season since 2000/2001 that the Amerks have had at least five players score 20 or more goals. * The 35 shots the Amerks registered on net was pretty good and then there were a lot of blocked shots. * One is the magic number. Rochester only needs one point to officially clinch a playoff spot. They’re also only one point back of the first place Syracuse Crunch as of writing this. The Amerks are in Binghamton for a 7:05pm road game to close out the month of March.